We had lunch at Murrayville in Western Victoria at a rest area and this Eremophila formed a screen on one side of the picnic table. I am not really sure whether it is a hybrid, but it has the look of Eremophila oppositifolia, but then again, not quite. So I am assuming it is a hybrid, as many Eremophilas do form natural hybrids in the wild and they are being propagated. 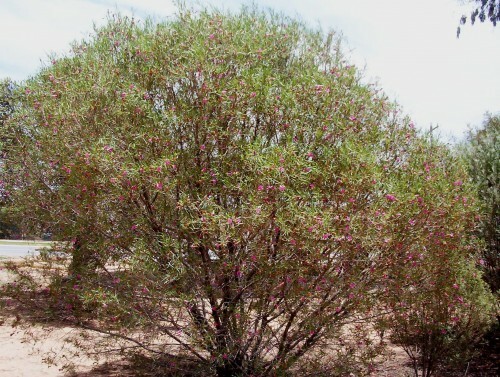 This plant has pink flowers with spots in the throat. 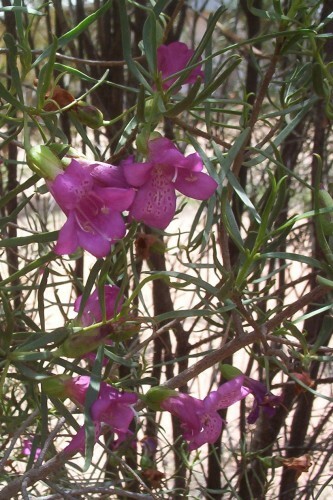 The pure Eremophila oppositifolia has white, cream, pink or purple flowers, all of which are very pretty plants. In most cases the plants I have seen are around two metres tall. These possible hybrids were about two and a half metres tall and nearly the same width. Further along the road is a planting that I admired and had a number of photos of from a couple of years ago. I was really disappointed to see so many of the plants dead. This area has been in drought for a while. Some Eremophilas need a reasonable rainfall, probably deep drinks, infrequently, rather than small amounts often.